Dr. Vishnu Vageesa Sharma completed his MBBS from Kerala University in 1995. Dr. Vishnu obtained his MD from Delhi University. He has trained in several courses affiliated by international cardiology societies. He has European and Indo-American accreditations in Echocardiography. 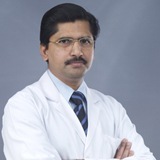 Dr. Vishnu has a vast experience in the fields of Cardiology and Internal medicine. He was previously associated with Escorts Heart Institute, New Delhi as a Cardiologist. His special areas of interest include cardiac risk assessment, ECG and holter analysis, non-invasive cardiac imaging including Echocardiography and Stress Echocardiographic interpretation. Dr. Vishnu can speak in English, Hindi, Tamil and Malayalam.